The CTS, a midsize luxury car, is said to be the first vehicle to employ dual LED-based daytime running lights, which consist of two groups of eight white LEDs at each headlight. An extra set of co-located amber LEDs will also serve as turn signals. And the vehicle’s back end will employ 51 red LEDs at each tail light, and 48 more for the center high mount stop lamp (CHMSL) on the trunk lid. The use of LEDs on vehicles is hardly a new idea — manufacturers of luxury cars have been using them for years. The Ford Mustang has even employed them in cup holders, map pockets, dashboards, and footwells. Similarly, the entry-level Dodge Dart recently used them to form a ruby red “racetrack” around the car’s trunk. 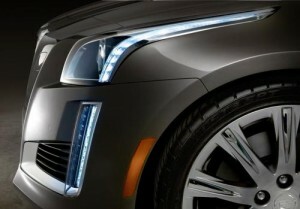 On the CTS, Cadillac designers wanted to create an aggressive face with slim, uniformly-lit lamps. They saw it as a change from earlier Cadillac vehicles, which used big bright blocks of LEDs in ways that were less satisfying to the eye. In essence, the CTS replaces those big bright blocks with a trimmer, more elegant signature. “The corners of this car in the front are unique, and LEDs were a big enabler of that,” Smith said.